NYC, 02/20/2019, 11:00AM. Researching African American Historical Newspapers. The New York Public Library has cultivated one of the premier collections of African American historical newspapers in the United States. A large number of these newspapers are now digitized and searchable from your home or library computer. This e-resources training will provide patrons with a detailed overview of these historical African American online newspaper collections. Patrons will leave with knowledge of where to find content and how to expertly navigate all of the important features from these databases. 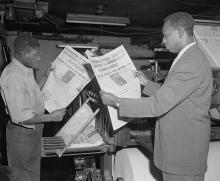 These newspaper collections range from popular papers still in existence today, such as the New York Amsterdam News, major newspapers no longer in print, such as the Baltimore Afro-American, newspapers that predated the Civil War, such as Freedom's Journal, as well as independent African American newspapers from the 1960s and 1970s. Historical newspapers are invaluable primary source materials and this training will help you get the most out of your research.